Should We Rethink City Centre Public Transport Access And Pricing? In my view, certain city and town centres in the UK, have too many vehicles going through. But London has a plan to increase capacity on its Underground and Overground network. Crossrail to increase E-W capacity – Opening by 2020. Thameslink to increase N-S capacity – Opening in 2018. The Northern Line Extension to Battersea to increase N-S capacity – Opening by 2020. The Northern Line will be split into two lines, after rebuilding Camden Town station – From 2025. The New Tube for London to increase capacity on the Deep Tube Lines – From 2023. New trains on the Overground from Liverpool Street – From 2018. New trains on the Gospel Oak to Barking Line – From 2018. Infrastructure on the Underground is being improved with more lifts, escalators, wi-fi and 4G access. 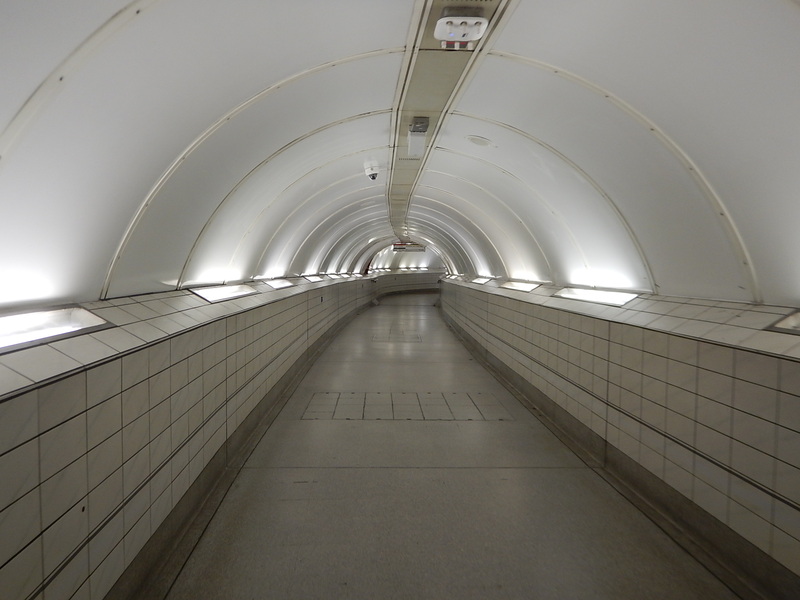 The Bakerloo Line is being extended – From 2028/2029. In addition, there will be a lot of improvement to walking and cycling routes in the City Centre. Crossrail will be running 24 nine-car trains per hour between Whitechapel station in the East and Paddington station in the West, via the massive combined Moorgate/Liverpool Street, Farringdon, Tottenham Court Road and Bond Street stations. Thameslink will be running 24 eight/twelve-car trains per hour between Kings Cross St. Pancras station in the North and London Bridge and Elephant and Castle stations in the South, via Farringdon, City Thameslink and Blackfriars stations. The dear old Victoria Line will be running 40 six-car trains per hour between Finsbury Park station in the North and Vauxhall station in the South., via seven intermediate stations including Victoria. The two Northern Line branches; Bank and Charing Cross, will each be running 36 six-car trains per hour between a rebuilt Camden Town station in the North and Kennington station in the South. The Central Line will be running over 30 six-car trains per hour between Liverpool Street station in the East and Notting Hill Gate in the West, via ten intermediate stations including Bank and Marble Arch. The Jubilee Line will be running 36 seven-car trains per hour between Canary Wharf station in the South-East and Baker Street station in the North-West, via eight intermediate stations including London Bridge, Waterloo and Bond Street. Just these major services add up to a total of over three thousand cars an hour passing through the City Centre. The Northern Line counts as two lines, as once Camden Town station is rebuilt, it will be split. The other five lies are either new or have been substantially modernised. I have deliberately chosen end stations either in Zone 1 or Zone 2. The Central and Jubilee Lines can almost be considered subsidiary lines of Crossrail, running stopping services that call at a lot more stations. And then there are the second level of unmodernised lines or ones just outside the City Centre. The Bakerloo Line will be running at least the current twenty six-car trains per hour between Paddington station in the North and Elephant and Castle station in the South, via ten intermediate stations including Marylebone, Baker Street, Oxford Circus, Charing Cross and Waterloo. The Circle Line will be running at least six seven-car trains per hour in a circle around Zone 1 and on a spur to Hammersmith station. The District Line will be running at least eighteen seven-car trains per hour between Whitechapel station in the East and Earl’s Court station in the West across the South of Zone 1, via fourteen intermediate stations including Cannon Street, Blackfriars, Charing Cross and Victoria. The East London Line will be running at least twenty six-car trains between Shreditch High Street station in the North and Canada Water station in the South, via four intermediate stations including Whitechapel and Shadwell. The Hammersmith and City Line will be running at least six seven-car trains per hour between Whitechapel station in the East and Paddington station in the West across the North of Zone 1, via nine intermediate stations including Liverpool Street, Moorgate, Farringdon, Kings Cross St. Pancras and Baker Street. The Metropolitan Line will be running at least eleven eight-car trains per hour between Aldgate station in the East and Baker Street station in the West via seven intermediate stations including Liverpool Street, Moorgate, Farringdon and Kings Cross St. Pancras. The Northern City Line will be running at least ten six-car trains between Highbury and Islington station in the North and Moorgate station in the South, via Essex Road station. The Piccadilly Line will be running at least the current twenty-one six-car trains per hour between Finsbury Park station in the North and Earl’s Court station in the West, via fourteen intermediate stations including Holborn, Piccadilly Circus and Green Park. The Waterloo and City Line will be running at least eighteen six-car trains per hour between Waterloo and Bank stations. I have included some Overground and National Rail Lines in this group. These routes add approximately forty percent capacity to the City Centre routes. Don’t underestimate the Northern City Line. All of these lines create an extensive network of lines in London’s City Centre. London’s City Centre has the following problems. Limited parking for the disabled. The air pollution is getting worse. No space to put any new roads or parking spaces. Safety for pedestrians and cyclists could be improved. I return to half the question I asked in the title of this post. Should We Rethink City Centre Public Transport Access? I think the answer is yes, as get it better and travellers might be persuaded to abandon their cars further away from the City Centre. These are a few things, I’d improve or change. This is not always the case. There should also be enough parking for the disabled. Outlying stations in London are better than most, but some stations need more and better bus routes with better information. Get it right and it might mean that the need for more car parking is avoided. All stations, platforms, lifts and trains must be suitable for a list of approved scooters, wheel-chairs and buggies. Some interchanges like Kings Cross St. Pancras, Green Park and Waterloo are designed for people, who like to walk down endless tunnels. Transport for London can do better as this picture from Bank station shows. Some certainly need travelators and more escalators and lifts. My particular least favourite station is Kings Cross St. Pancras, where I always go by bus and come home by taxi, as Underground to and from train, can be a real case of walking for miles. It’s as if the station complex was designed by someone with a real sadistic streak. I’m going to Chesterfield from St. Pancras on East Midlands Trains today and will get a bus to in front of the station and walk the length of the station to the platforms at the other end. When Thameslink is fully open, everybody will be complaining about the lack of lift connections between Thameslink and the EMT platforms, which are on top of each other. You can’t win with St. Pancras! At Victoria and Shepherds Bush stations, new entrance/exits have been added, and the future Bank, Bond Street and Camden Town stations, will have multiple ways to get in and out. In addition the massive Crossrail stations at Moorgate/Liverpool Street and Tottenham Court Road will be labyrinthine, with two or more entrances. 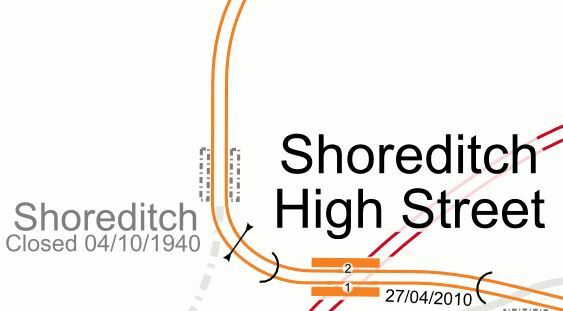 This map from carto.metro.free.fr shows how the East London and Central Lines cross at Shoreditch High Street station. This would be my choice for an extra interchange, as it would mean that I would get easy access to the Central Line after three stations from Dalston Junction station, which is my nearest access to trains. Crossrail and Thameslink could be railways with an unusual usage profile. I believe that outside of the Peak, the central sections of these two routes could have a much more relaxed feel with the ability to handle lots of passengers in the Off Peak. They will also be like express motorways taking the pressure off lines like the Central, Jubilee, Northern and Piccadilly in the City Centre. So will this spare capacity, change passengers habits and attract more leisure travellers into the City Centre? Get the access right and make the City Centre, easy to access from everywhere, with all stations step-free and especially in the City Centre itself, and couple this with the new capacity, I believe that we can reduce the traffic in the City Centre, by encouraging drivers to leave their vehicles further out. Pricing of tickets could be the smart weapon to encourage this use of Park-and-Ride. London’s ticketing system, which is based increasing on contactless bank cards collects masses of data about passengers movements and thus Transport for London know all the busy routes and stations. The system works by logging your various journeys throughout the day and then charging the card overnight, applying any daily, weekly or monthly caps. Very radical ideas could be applied to the ticketing rules. For example, anybody who has come into the City Centre from the suburbs can have as many Zone 1 journeys in the day as they want. So a couple of typical Essex Girls might leave their expensive wheels at Chadwell Heath and just tap in and out all day, as they travelled between Bond Street, Eastfield, Knightsbridge, Marble Arch and Westfield. How much economic activity would this sort of behaviour generate? If London can persuade anybody coming into the Centre, that the place for a vehicle is not in the Centre, then there will be secondary effects. Air pollution levels will drop, especially if all taxis and commercial vehicles are zero-emission. Bus numbers can be reduced, if the Underground is more convenient and free for short journeys in the City Centre. If traffic in the centre drops, more and more journeys will be done on foot or a bicycle. Would it also mean, that vehicles could be properly charged for coming into the Centre and checked.accordingly. Would this drop all forms of crime? Some towns and cities in the UK are developing city centre networks. always interested in your transport musings… I remain convinced that a new branch from Essex Road for the Northern City line would overcome the capacity restraint caused by the terminus of Moorgate, Allowing say 24 tph to operate in a core of Essex Road to Ally Pally, This would create a metro service relieving Piccadilly and negating the need for a branch of crossrail 2 to New Southgate … this branch would have stops at Mount Pleasant development [with interchange to circle/metropolitan, H&C] , central line at Chancery Lane and Aldwych, before continuing to link with an appropriate service south of the river. I think there could be two problems. There are a lot of lines in the area and a lot of tower blocks, so finding a route through could be difficult. But I think the main reason is that the Northern City Line tunnel isn’t the best! Perhaps putting a junction in would be just too risky. They also might want to reroute Crossrail 2 through the Essex Road. You actually make it seem really easy with your presentation but I in finding this topic to be actually one thing that I think I’d by no means understand. It sort of feels too complicated and extremely broad for me. I am taking a look forward on your next put up, I’ll attempt to get the grasp of it!